This image is taken from the paper Insulin requirement for the antihyperglycaemic effect of metformin and it deserves a little consideration. They are using BB/S rats which spontaneously develop T1DM if fed standard rodent chow. In the absence of exogenous insulin they die but giving them a little Ultratard twice daily keeps them alive for quite some time. Stopping the Ultratard allows exogenous insulin withdrawal to produce an acute, alive, an-insulinaemic rodent model. This is the model used and at the start of this experiment the rats had no detectable insulin in their blood. At time point -60 these an-insulinaemic rats were given metformin intrajejunally. Over the next 60 minutes the metformin did nothing to lower plasma glucose. At time point zero they were given a small intravenous bolus of glucose. Metformin had no effect on the additional hyperglycaemia induced. At time point +90 they were given neutral insulin intravenously. 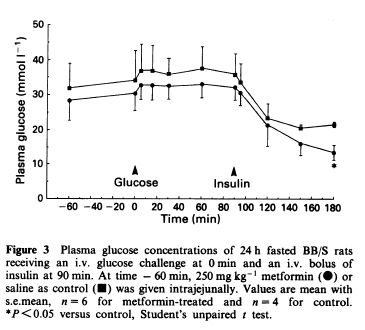 In the control group plasma glucose concentration dropped to a nadir of 20mmol/l at time point +150 but in the metformin treated rats the same dose of insulin continued to reduce the plasma glucose to 10mmol/l at time point +180, when p dropped below 0.05. Insulin is essential to demonstrate any effect of metformin on blood glucose. Any idea about how metformin works, be that via the inhibition of mtG3Pdh or via inhibition of complex I, has to accommodate the essentiality of insulin. 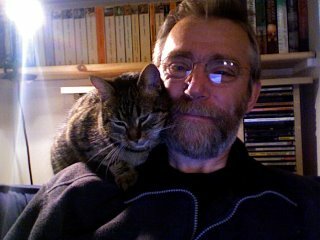 We've moved house. It has not been the simplest of moves. OK, it was awful. However it was also worth it as we live here now. Anyway, we're alive and busy and now live some distance from the nearest main road (in Norfolk terms).